This discussion is based on my 3 cars all of which have the EZ-117K Jetronic Ignition which is for the 4 cylinder engine, with distributor on the rear of the cam shaft, the timing signal is from the Hall effect sensor within the distributor or an RPM sensor on the flywheel, air is measured by an air mass meter, it has a knock sensor, and throttle position switch. I have had three 740s and though I am not a professional mechanic I’m a pretty good DIYer. I seldom use a dealer or independent shop unless time or tools require it. I am an engineer and like to know what’s wrong and how that affects the engine My basic reference are the Volvo shop manuals, especially the electrical, engine and ignition manuals. I will try to show a systematic approach to based on a chronological order where applicable. Power is supplied to the IGNITION CONTROL UNIT , hot side of the COIL, POWER STAGE, and most accessories. The starter pinion gear meshes with the ring gear, the high ampere connection made and the starter motor operates. Engine turns over. The sequence of events is as follows. IGNITION CONTROL UNIT (ignition computer) sends power to the DISTRIBUTOR. POWER STAGE (ignition amplifier). This feeds the coil which then send high voltage to the center tap of the distributor where the distributor sends the high voltage on to the correct spark plug. grounds the FUEL RELAY which (hopefully) turns on both the IN-TANK FUEL PUMP and the HIGH PRESSURE FUEL PUMP. Fuel then flows under pressure, in the 30 to 40 PSI range (though the pump is capable of pressures up to 80 PSI), into the fuel rail. At the front end of the fuel rail is a PRESSURE REGULATOR that maintains a pressure in the 30 PSI range though it varies according to engine vacuum. A higher vacuum, as when idling or running lightly, allows more fuel to flow back to the tank and the pressure is reduced in the fuel rail. When under higher pressure or even turbo boost the pressure in the fuel rail is higher and more fuel is delivered for the same amount of injector open time. Opens the INJECTORS for the appropriate time. Note, since this is not a sequential fuel injection system, all INJECTORS fire at once and timing is not an issue other than that they fire each half resolution, so that fuel is in the intake manifold ready for any intake valve to open. Now the engine starts, however, there is more to it. If the engine is cold, like the first start in the morning, the AIR CONTROL VALVE opens and acts like a fast idle cam on old non fuel injected cars. The controlling signal on this is the COOLANT TEMPERATURE SENSOR. Generally only a few seconds is needed for this to be open, however, under some conditions it closes, the idle speed drops significantly and it opens again. There is no choke but since the choke only forces a rich mixture the FUEL CONTROL UNIT will open the injectors more times and/or for longer periods. The OXYGEN SENSOR warms up and begins to send a signal to the FUEL CONTROL COMPUTER that in real time varies the mixture to maintain a mixture that delivers power with minimum emissions. The KNOCK SENSOR ‘listens’ for the characteristic sound of a knock and sends a notice to the IGNITION CONTROL UNIT which retards the spark in steps of 2.8° up to 10° to 16°, until knocking ceases. Then it advances the spark in steps of 0.37° until, if possible, it return to the normal advance. After fully warmed up and running the COOLANT TEMPERATURE SENSOR is continuously monitored and if it indicates an overheat condition it advances the timing by 13° if the throttle is closed on the B230FT engines. If the engine is turning over rapidly, above idle speed, the spark and fuel are adjusted to give the maximum engine braking. When the engine drops to near idle speed the spark is retarded so as to provided a smoother idle. One item occurs after the key is turned off, that is that a voltage is sent to the AIR MASS METER to burn off contaminants that have accumulated. Spark Plug Notes. See Removing Spark Plugs, Re-Threading Spark Plug Holes, and Installing Spark Plugs for more information. with heat shrink. Attach the alligator clip to the other end of the wire. This is your GROUND WIRE. Connect a 10-12' piece of wire to the other lead of the neon bulb. Insulate the connection with shrink tubing. This is your ANTENNA WIRE. I like to put a larger (diameter) piece of shrink tubing over the bottom part of the bulb, including the other shrink tubing for mechanical strength. Find a convenient, out-of-the-way location for the bulb (preferably out of the light). Connect the ground clip to metal chassis. Feed the "antenna wire" through the firewall and over the engine. Take pains tosecure it away from moving stuff, like the fan. Wrap the "antenna" around one plug wire about 15 times, and tie the end of the wire back over itself. DO NOT electrically connect the "antenna" to the plug wire or to anything else. It picks up the electrical pulses by induction (hence the term "antenna"). Anytime there is a spark pulse in the wire, the neon bulb will flash -- dimly, but still flash. This does nothing to the effectiveness of the ignition system, so can be left there for a month or a year. When the engine's running, the bulb will flicker. When you're cranking the engine on a cold, rainy morning, you can watch to see if there's spark. If you have a similar test light attached to the fuel pump, you can see if the pump's powered. Ignition Failure after Hot Soak: Won't Re-start. [Symptom:]My 1988 744 Turbo with EZK 117 ignition starts and drives fine with A/C on in 95 degree Maryland weather for about 30 minutes. It won't start once it is turned off. A strobe test shows no spark. It sits for several hours (cools down presumably) and then starts right off. In its disabled state there is system voltage registers at both sides of the coil and at terminals (1) and (4) of the Power Stage (booster). [Diagnosis:] First, check for a cracked and/or oil-contaminated harness connector on the side of the distributor. If this is okay, then replacement of the Hall Sensor in the distributor is the fix. Heat rises in the stopped engine and increases temperature of the rear-top-mounted distributor. A weak Hall breaks down and ceases to send pulses to ignition control module; hence, no spark. Be careful not to bung-up the rivet holes in the distributor body when you drill out the Hall attachments; you need a good lip for the new sensor rivet ends to crush against. Mount two bolts in a vice and use them as supports for the inner ends of the rivets as you mash the outer ends with a drift. [More on Hall Sensor:] Best idea when replacing the Hall Sensor is to take the whole unit (just the bracket) to a dealer and ask them to drill the old one and put the new one in. The rivets on the Hall are harder than the aluminum bracket plate so if your drill slips out you will have to buy a new distributor cause you can not buy just the bracket. If you replace it yourself, you will need the help of a second person to put the sensor back on. It has 2 rivets that need to be drilled out. When you place the new one on you need a second person to hold it squarely over a punch so you can peen the rivets in place. There are instructions in the Volvo manuals. Be sure to note the way the collar with ears comes off. [Contrary Opinion on Hall Replacement:] Although Volvo sells the Hall sensor separately from the distributor assembly, a new distributor is usually more cost-effective for two reasons: First, installing the mounting rivets in a new sensor is awkward, tedious work . Because the sensor location prevents you from getting a straight shot at the rivet heads, it's very difficult to drive the rivets in securely. Second, bushing wear is common in higher-mileage Volvo distributors. You can usually feel the wear-lateral movement in the distributor shaft-with the distributor removed from the engine. A sloppy distributor shaft usually goes hand-in-hand with distributor oil leaks, especially through the seal protecting the inside of the distributor. [More:] Next time you have a hard ignition failure pull a plug wire, insert an old spark plug, ground the outside and check for spark. Now assuming that is it, go to the coil center high tension lead and check for spark. Next ground the coil's high tension lead and put a meter on the coil's 12v terminals. No 12v switching? Since most systems apply 12v and switch the ground lead, if there is no 12v at all, check the power lead to the ignition, wiring, fuse etc. If you do have 12v but no switching then check the reluctor in the distributor. Disconnect the leads from the reluctor (in the distributor) from the ignition module and measure with a sensitive DMM. You should see some small voltage as you crank. At this point you've checked the power to the ignition module, the reluctor, and the spark delivery path. That means the only thing left to do is repair/replace the ignition module. More: My wife's '92 745T with same engine (?) behaved in exactly the same way for a long time, maybe a year or two, before we figured out that it was a bad sensor. (The sensor screws into the top of the bell housing -- I can't recall the term for it.) It was an intermittent fault, probably related to a break in the wire: wiggling it as the engine ran stopped it cold, although it still cranked. Wiggling it the other way allowed it to start. Does My Car Have a Hall or RPM Sensor? You can quit worrying about the Hall sensor if you have a 89 or later non-turbo or 90 or later turbo. The Hall sensor is gone in favor of the RPM sensor on top of bell housing. In these cars, there is no plastic wiring connector on the side of the distributor plate and no wires into the distributor other than the high-tension spark leads to the cap. Testing Hall Sensor. Undo the distributor connector. When the ignition is ON the Voltage between positive terminal (red lead -Nr. 3) and ground should be approx. 11V - Voltage between (blue lead - Nr.2; middle one) and ground should be 5V - Resistance between (black lead - Nr. 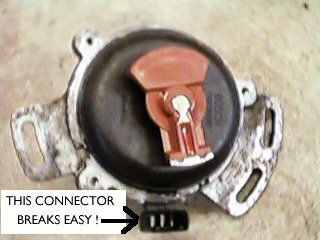 1) and ground should be "0" Ohms Undo connector from the control unit (above the brake pedal) and remove the sealing washers (plastic inserts on the side of the connector). Replace connector without cover or sealing washers. generator. Correct voltage: Less then 0.7V or more than 1.8V. Replacing RPM or Hall Sensors. RPM Sensor: If your car is a non-turbo 89+ model then it has a flywheel reading RPM/Position sensor that is down below the rear of the cylinder head, mounted on the bellhousing through a bracket retained by one bolt that should be a 10mm head on a 89. It is connected to wires above the engine on the firewall. Hall Sensor: If it is 89 turbo or pre-89 then it has the Hall switch that is in distributor. The Hall switch is tough as it requires that you knock out a pin and pull out the shaft, then VERY carefully drill out a couple of pins that retain the hall switch. Then you have to be very careful about supporting the distributor base while bradding the retainer pins to retain the new hall switch. If you slip while bradding the pins then you punch out a hole in the base and then you need a new distributor. [Response 2:] Changing that is not for the novice. It is riveted into the distributor. Some dealers offer rebuilt exchange on the distributors. Before you jump to the hall sensor, carefully examine the wires from the firewall to the distributor, which sometimes break inside from years of flexing. These can be repaired with a little work. Also, check the brittle plastic connector where the wires go into the distributor. This can cause intermittent shorting. The plastic fitting is Volvo PN 1346793, about $3.00 as I recall. If you are going to remove the distributor for any reason, carefully scribe a mark to return it to its exact former position so as not to change the timing (the holes in the distributor are slotted). [Response 3:] I've done few of these. Never alone, however. Drill out the old rivets carefully and pry out the sensor. Next, have an assistant you can trust with approximately $ 70.00 hold the new sensor in its proper place on the distributor plate. Place a steel punch of roughly same diameter as the rivets into the bench wise. Have the assistant hold the D. plate in such a way that the rivet is directly over the punch. Now, YOU, using the second punch and a hammer CAREFULLY hit the top part of the rivet. It will take MANY hits since these darn rivets are made of steel. The key here is steady hands, and frequent breaks. One wrong move, and you are done. Simple physics tell you which, steel or aluminum will crack first under constant hammering. This is akin to putting a horse shoe onto an a hard boiled egg, possible but very nerve wracking. [Query:] I have the beginnings of an oil leak at the distributor o-rings (just beneath the shaft on the B230F distributor.) According to Chilton's, it's easy to pull the cover, cap and rotor, remove the shaft, and pull the distributor out to replace both the big dust cover o-ring as well as the smaller o-ring inside on the shaft. Has anyone actually done this? Is access a problem? How about replacing the distributor: do you have to pay close attention to shaft alignment? [Another Related Query regarding Timing:] My distributor appears to be seeping a small amount of oil on my 93 940 (sohc engine). I noticed this while doing the 90 kmiles service. I also noticed the PO or his mechanic ditched the plastic dust shield. First thing Monday, I'll get the dust cap as I'm thinking it will keep the rotor and inside the cap clean. But I'm thinking maybe its time to replace those nasty o-rings. Just one question, my book claims the timing is not adjustable. I'm kind of wondering how do I set the timing, if I pull the distributor and replace those o-rings? I can't find any info on this in my books. Removing the Distributor: [Editor's Note:] The spark plug high-tension leads will probably be tough to remove if you did not use dielectric grease on the boots last time they were installed. Gently pry up the boots about one centimeter with a blunt blade that won't scratch the cap, then pull them off while holding the tops of the boots. [Response 1: Don Willson] Mark the spark plug wires and the Hall connector down below (if used) and push the connector "hair pin" in and pull down. Remove the three cap screws with an 8 mm metric open end wrench. The screws in the cap are captive and will not drop out. [Hall switch distributors: Mark the position on the locking screws on the adjustment slot. Non-Hall distributors have a self-aligning plastic device] Pull the cap straight back. Remove the two 10mm distributor plate bolts. Pull distributor straight out the back, noting the position of the plate, rotor and offset eared drive cog. Draw a diagram so you can reinstall everything correctly and not 180 degrees out of alignment. [O-Rings: Kevin Lawlor] The small o-ring fits on the end of the shaft and the large o-ring fits on the housing. Use a little Vaseline to install easily. [Tip from JohnB] There are three O-rings, but the inside one is almost impossible to replace, just forget it. The big O ring on the housing is generally the leaker and the little ring on the shaft helps to keep oil out of the distributor itself. 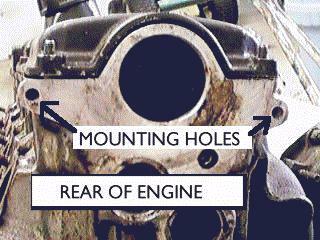 [Center Shaft Seal: Bruce] There is a center shaft seal inside the distributor plate that dries out and leaks oil. This shaft seal is not available to the public that I know of. [Editor: try RPR] There is a pin that needs to be driven out of the shaft that holds on the driver. This pin is not easy to remove. [Another Note:] For those that have oil leaking out of their distributor via the centre shaft, I have just replaced the seal on the centre shaft that Volvo says you can't, using the IPD tool and seal kit. [Editor: Tool not available.] Wasn't particularly difficult, just followed the instructions in the kit and it all went smoothly, all you need is a vice, hammer and a punch/drift. A whole lot cheaper than a new dizzy from Volvo. [Removal Tip from Tom Irwin:] The solid pin should be much easier. Generally, pressing the pin out with static force works better than shock force. Use a vise with a counterbored block of solid material in the rear jaw to support the shaft against compressive force, then at the front jaw, use a hardened pin or drill bit as a drift and squeeze it up gently. A large nut in the rear jaw should be all the fixture you need, maybe Dremel it out to roughly match the contour of the shaft. When the pin extends enough out of the shaft, grab it up with a vise grip and yank it out. Orientation: Mark all removed pieces and their orientation. The cogged driver can be installed 180 degrees in reverse and the car will not start. Older Distributors using Hall Sensors. While the distributor is off check the 'housing' carefully...that's the official Volvo part name for the little black connector that has three blades in it that connects the Hall effect sensor to the wiring harness. It's about $3.00 or so and breaks down in 10 years of oil and heat and engine washes. It's fairly difficult to reinstall...strong fingers and a pliers required. Needle nose maybe to pull the blades entirely into the housing once the housing is on the distributor body. But the housing replacement is thoroughly gratifying if the connector was just hanging there. FWIW, I tried to repair/replace the housing with epoxy and it just didn't hold. [Tip: JohnB] The black plastic housing for the ignition trigger connector is replaceable...you don't need to get a new distributor to replace it. Highly recommend you replace it. [Response: Bruce] Don't try doing the Hall sensor replacement yourself unless you get the IPD kit [Editor's Note: it's not clear this is still sold]...drilling out the rivets is a hassle too, the drill slips and reams the hole/s out and the new rivets won't hold. If you can locate a Bosch aftermarket source or an independant Volvo repair center try to get a complete new distributor, cap and rotor as one unit. They are not cheap. The Hall switches are replacable. You have to drill out the old rivets and pin in the new rivets. It is very easy to crack the new hall switch or plate while pinning the new rivets in place. The plastic connector needs replaced that the hall wires go into. Price out the Hall switch, o-rings and cap and rotor. You may not be much less that the price of a complete new unit. Shop around for a Bosch service center or and independent Volvo repair center who may sell you the complete Bosch unit cheaper that a Volvo brand unit. Newer Distributors using RPM Sensors: [Response: Abe Crombie] The ignition system uses a crankshaft reading RPM sensor for timing. The distributor has no bearing on timing. Take note of the position of distributor by looking with a mirror at the relative length of distributor adjustment slots where bolts go in. You may not need to do this as there should be a plastic piece in one of the bolt holes that positions the distributor housing. The distributor only goes into cam in one possible position due to the offset slot that drives distributor via an offset eared piece. When you pull distributor shaft out to replace the shaft seal take careful note of position of the eared drive cog so it can be put back in the same place and not 180 degrees off. Re-installing the Distributor: Put new O-rings on (big one on housing and little one on shaft lubed with Vaseline) and use antiseize on the aluminum housing bolts. Use antiseize paste on the aluminum body of the distributor, just a fine film will do...helps to get it out next time. [Editor's Note: the newer distributor uses a plastic alignment fitting to ensure the distributor is re-installed correctly. 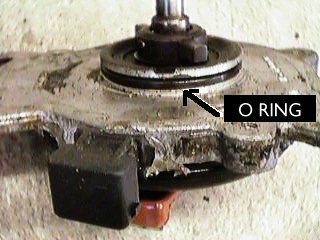 Don't move this fitting when you disassemble the distributor] The rotor is installed in one direction only, matching the slot on the shaft with the ridge inside the rotor. Make sure you have a dustcap installed under the rotor....it serves to keep crap from the hall sensor innards as well as oil from the engine from getting to the inside of the distributor cap. I found out a year after the dealer had re-O-ringed the distributor and replaced the ignition wires (don't ask...I now do my own O-ringing there) that the clown had left off the dust cap. It's a few bucks at the dealer too...un-obtainable at auto stores. The dust cap is pre-installed on Bosch caps. Use silicone dielectric grease on the spark high-tension lead boots to make both installation and removal easier. Use your finger to align the metal lead in the boot into the cap, then push down hard. It snaps home when correctly installed and you cannot easily pull the lead back off. If it won't snap home, then make sure you have not bent the metal connector. Re-installing the Hall Sensor Distributor: Check your timing when you put it back...I found out mine was at 5 degrees BTC vice the 12 in the manual...makes a noticeable difference in bottom end torque when you launch!!! Engine Hesitates When Humid. [Query:] During periods of great humidity while driving at normal operating temperature, engine cuts out and then after a second or 2 (sometimes more) it picks back up or stalls. If it stalls sometimes it will start back up sometimes it won't; In this situation (not starting back up) engine turns over but absolutely no ignition. This model is a 760 with turbo and intercooler. [Response:] The secondary ignition parts are the first suspects for your trouble. The rotor can develop a hole from spark hunting a place to go. The hole will be from center of rotor where distributor cap contact touches through to underside where it sticks onto shaft. This effectively shorts out spark. If, when you say "no ignition" you mean no spark out of coil wire, then you needn't look at cap, rotor, & wires. Then look for arcing coil top. The coil can develop an internal short where the hole where coil wire inserts gets a crack that allows the spark to jump to one of the other leads killing spark. OR your hall switch is defective. If the hall switch or the hall switch (hall switch= sensor assy. inside dist) connector is the problem then you will see tachometer die INSTANTLY when problem occurs, i.e. tach drops to 0 before the engine actually quits turning. Corrosion at the power stage connector (black and gray unit wire connector behind and a few inches below headlight level on driver's side inner fender behind air cleaner if it's a non-turbo) will cause it to die with instant tach loss also. Intermittent Ignition Failure: Power Stage [Query:] As you are all well aware, intermittent problems are a b*tch to correct. However, last night, the car started fine but stalled halfway out of the garage and would not restart as has happened several times before. I've always suspected an ignition fault rather than fuel as the engine dies instantly when it happens. No sputtering, rough running or anything like that, it's like the key was turned off. First thing I did was hook up my timing light and had one of the boys aim it at me while I cranked it over. No indication of currant flow in the plug wire. Now I can dismiss the fuel/fuel injection system (I think). Next I connect my Fluke Meter to ground and the positive lead to the positive side of the coil and switch on the ignition to the run position. No Voltage! I ran back into the house to get a jumper lead - I was going to run it directly from the battery to the coil but when I tested for voltage again it was there. Get in the car and it started right up and died before I could put it in gear. Open the hood and check for voltage at the coil and it's gone. Now, w/o touching the key (I'd left it in the run position), and without "tapping" anything with a hammer or "jiggling" any wires, I test both sides of the coil for voltage again. I test the positive side of the low tension ckt and it's 0 volts w/ respect to ground, test the other low tension lead and it to is 0 volts w/ respect to ground. Test the positive side once more and the voltage is back! Get in, start the car and it runs fine. Anyone know what might be causing this? [Response: Randy Holst] From a similar experience I had with my (now departed) '84 760T, I would suggest that it is the ignition control module, which is mounted on a heat sink on the inner driver's side fender well next to the battery. At a very inopportune time and location, mine quit working when I closed the hood while the engine was running. The engine immediately quit as though someone had turned off the ignition. The result was no spark, no juice to the coil and no amount of fiddling around would change anything. (Long story about having the car towed, isolating the problem and having a replacement part flown in omitted.) Replacing the ignition control module cured the problem and it never reoccurred. Engine Suddenly Stops While Driving. [Query: Intermittent engine failure, not temperature related.] [Response:] I'd certainly look for a loose wire in the engine bay. A complete, sudden, intermittent shutdown of the engine seems very much like an electrical problem - likely a wire. If the revs drop to zero at once, i.e. even while the dead engine is still turning over, that means that the ignition system has shut down. This could be because it's power has been cut, or because the hall effect sensor's wire is loose or something. It is less likely to be in the HT side, because the rev counter is not affected by the HT, only the LT. Try wiring a small, say 5W, 12V bulb to the coil "+" terminal, and start the car. The bulb should be on; If when the car dies the bulb goes out, this means that the coil, and hence the ignition system, has lost power. If you use a light bulb as opposed to a voltmeter, you will be able to see if there are bad connections - if the bulb flickers when you hit a road bump, for example, that's a very good sign of a bad contact. Failing that, wire the bulb to the fuel pump. All these tests would tell you is if the power is being cut to either the ignition or injection systems; it could still be that some other wire is loose. place, and then smoothing out once I took my foot off the gas. Does this sound familiar to anyone? [Response: Abe Crombie] Two things come to mind when you have an cut-out with an instant tachometer drop chaser: 1. the rpm sensor behind and below cylinder head that reads perforated surface on flywheel is going open 2. the ignition power stage has a faulty connection or is faulty. Failure to Start; Flywheel Sensor Bad. [Query:]My 1990 740GL has been having trouble starting for the last few months. I replaced the cap, rotor, plugs and fuel pump relay. The wiring harness looks fine. Today it refused to start at all. Cranks fine, but no spark. I unplugged and re-plugged the flywheel position sensor at the firewall and it started! The contacts looked OK, but I cleaned them and put on some dielectric grease. Now we'll see if that did it. Question: I remember some talk on the list awhile back about a recall or TSB on faulty flywheel position sensors (impulse sensor) on late '80s 740s. I can't find the message on my hard drive. I seem to recall that the model with a yellow band was either the good one or the bad one. Mine is yellow. [Response:] The newer kind has a white band, as opposed to the older style yellow band. Replacement takes about 10 minutes. 1. When you turn the key on does the pump run for about 1 second? From your post I would assume that the answer is yes. This indicates that the fuel pump runs and the relay and ECM are capable of turning it on. 3. is there spark at the coil itself? (to test pull the coil wire part way out and have someone else crank the engine) If the answer is yes then the problem is in the distributor secondary (cap, rotor, wires) If the answer is no continue. 5. Is the power stage connected? yes? remove the connector and examine the terminals on both the power stage and connector if they are corroded they will need to be cleaned. Still no start continue. 6. IS THERE ANY GAS IN THE TANK? Car Starts but All Electricals Are Dead: Ignition Switch. [Query:] I can start my car but all the auxiliary electricals are dead. [Response: Bruce] The ignition switch has a dead spot. Replace the electrical part of the ignition switch. This is common for all 240's and 700's with the ignition key located in the dash. Move the key toward start a little, from the run position, and you will find the dead spot. Ignition Switch Replacement in 740/940. [Procedure from Mark O'Connell] I have replaced my lock on my 1989 765t. Do this before the lock will no longer turn!!! !.....If it's like my 89 (with the ignition lock on the column) Then you have to turn the lock to the run position (position #2) and there is a small hole on the top of the cylinder housing (assuming you have removed the plastic shrouding, and unplugged the connector on the back side of the cylinder housing) insert a small drill bit into this hole and depress, this will release the lock cylinder, and it should pull right out. If you wait until the cylinder won't turn, you have to remove the cylinder by drilling and grinding..
[Response from Bob] You don't have to remove the steering wheel under normal circumstances. The method for removing the lock cylinder is to remove top and bottom steering column covers, insert key, turn to position 1, press small button on top of column lock assembly (about 1" from end of lock cylinder) and pull out lock cylinder. If you have drilled out the lock, this method may or may not work. Try turning to position 1 with your screwdriver, press the button and see if it will come out. The button is brass colored, about 1/8 inch in diameter. It doesn't move very far. All it does is release the spring clip that holds the cylinder in. If you can't get it out, you may have to pull the column out and press off the whole lock assy. 1. On hot days when you start the car and the key position returns from 3 to 2, most of the electrical will not work. Turn signals, headlights, power windows, the 'Ding-Dong' seat belt reminder etc. Wiggling the key a bit would cause everything to come back on. 2. Occasionally, while driving, if your right knee should brush against the key chain, the engine will shut off. It's a little disquieting to have that happen whilst supercruising at 90+mph, #1 lane, on the interstate. Wait minimum of 10 minutes for SRS system to de-energize its back up power supply. Volvo book says to pull some other panels and disconnect the SRS trigger wire. I never saw the need to do that so long as you respect that 10-minute wait. Remove the lower knee bolster cover, two screws, T-25 I believe, working from the transmission hump, up and over, unsnap 1, unsnap 2, unclip 3 over below the headlight switch. Slide the large plastic cover out towards you. Pay attention how it slides into the two receiver slots, it's easy to screw up on reassembly. Don't forget to unclip the electrical connector from the foot well light on that bolster cover. Look up underneath the shroud that surrounds your steering column, ignition key assembly. There are 6 screws. 4 of them hold the 2 plastic halves together. Remove them now. The last 2 secure the bottom plastic half to the steering column itself. Remove them too. Remove the lower plastic half, set aside. Lower the 'Tilt-Wheel' mechanism as low as it will go. Remove the upper plastic half, set aside. Put the key in, turn to #2 position. Looking at the left side of steering column, see the bundled wire harness attached to the ignition switch? Good. Slip a thin, flat bladed screwdriver between the harness connector and the switch body. Gently work your way around until it comes off of the switch body, then pull it aside. Remove 2 slotted screws that hold the switch assembly on to the steering column. Remove switch assembly and replace with new one.